Most of time your smartphone battery consume lot of power, due to which smartphone performance also reduced. There are few apps consume lot of battery of your smartphone. Now, you should be able to easily remove five apps to improve smartphone battery performance. There are lot of reason due to which smartphone battery performance reduced. The main reason to reduce smartphone performance is the apps. Lot of time these apps not only consume the phone battery but also reduced the Android phone performance. Now you should remove five apps to improve smartphone performance. Today we have to discuss top five apps which how to improve smartphone battery performance. Lot of person don’t know few apps reduce the smartphone battery too much. If you want to improve smartphone battery performance then you should remove five apps. All we know very well about the antivirus software. With the help of antivirus you should easily remove the malware or virus from your Android phone. Most of the time we don’t know which antivirus is better for out Android phone. Lot of third party antivirus not only reduce the smartphone battery but also reduce the smartphone performance. Now, different smartphone companies provide inbuilt antivirus software which not only keep safe your data but also protect your phone with malware. You should keep only those third party antivirus which is better for your phone, otherwise you must have to remove it immediately. Google mapping app already installed in your Android phone. It helps you to provide map to reach the destination. But lot of person don’t know during using the Google Map your smartphone battery not only reduce but also warm your handset. The Google Map use GPS network to find the particular location. If you want to improve smartphone battery performance then you have to remove Google Map from your Android phone. You have to install another GPS tracker app which is available on Google Play store. Most of the person don’t known the default browsing software consume lot of Android phone battery. There are lot of faster and safe browsing software available on the Google Play store. You must have to use those browsing apps at the place of default browser. You have to uninstall pre installed browser from the “Settings” option of your Android phone. Data monitor app is used to check the data monitor on your Android phone. Data monitor app is used to monitor the data uses. These apps not only reduce the phone performance but also reduce phone battery. There is no need to un-install this app, you have to set data uses limit on your Android phone. Either you have to remove this app or set the credit limit on your Android phone. After reaching the data limit on the mobile data is automatically closed on your Android phone. If you want to set the data limit on your Android phone then tap on the “Settings” option. Tap on the “Data usages” and choose “Set data limit” option. 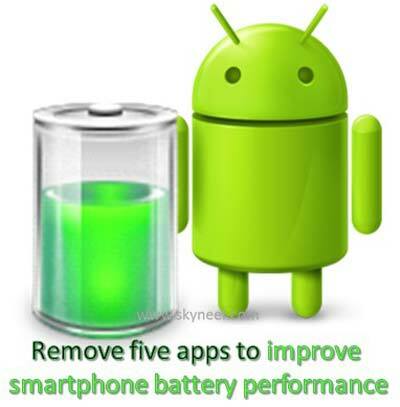 apps from your Android phone to improve smartphone battery performance. comment box. Thanks to all.